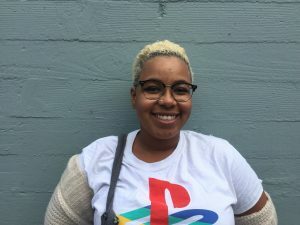 I’d like to continue introducing the members of the Audio Academy class of 2019 with a few paragraphs from Alyia Yates. She’s got a lot to say in a really great way, so let’s get to it! There is nothing more exciting and terrifying than your first day of school. You’re sleep deprived because your mind wouldn’t stop reeling. You practiced how you would introduce yourself in the mirror, though practicing it for the 40th time won’t make you look any less crazy. And finally you’re at the gates, all spruced up with the last packed lunch you will make because damnit, sleep is important. You’re bright eyed and bushy tailed and ready to take on the first day of the rest of your life, backpack and dreams in hand. Except, you’re 24 years old, you graduated high school almost seven years ago, and you’re not in a John Hughes movie. You’re starting your first day of Audio Academy. But jokes aside, the first day was a delightful and pleasant surprise. I was met with smiling faces and a syllabus full of lessons and projects that I was just ready to get my little acrylic nails on. The people who are in the office are so engaged and enthusiastic about their work that you can’t help but feel the hum of electricity in air. One of those individuals was my mentor and now avid brunch date, Lisa Morehouse. She took me through the high school to a wonderful spot overlooking the city (and a bunch a teenagers skipping gym class) and asked me what I wanted from this and how can we achieve that. I ‘bout damn near bursted out into tears. I was about to resume my radio training. Since I was but a wee child, I have always had a love for radio; my dad is a musician and my mom was a public speaking coach. Match made in radio heaven, eh? The thought of my silky vocal cords “sending one out to the ladies” on a late night radio station only listened to by truckers made me want it even more. But then ya go and put news and stories for the masses on it and, boom, you got to go to college for journalism. So I did my stint at Mills College and got my minor in Journalism and major in Intermedia Arts… so no radio right? WRONG! I was met by past KALW news director Holly Kernan, who would guide me in the ways of public radio like some audio angel. Alas, she had to go. But she foretold a prophecy that would lead me to the Audio Academy, and by that she told me I should apply to it when I was ready. Okay, maybe the prophecy part was a bit much, but I’m dealing with a lot of analogies here, so be patient. A diploma, some debt, and a serving job later, I am sitting in a room full of my peers waiting to be accepted into this radio clan and ready for my first tasks. And just like high school (see how I circled back there? ), before you know it, its midterm season, and you’re not as well-studied on the subjects as you thought you were. The first tasks were easy enough: the morning conference call, check. Fact checking other stories that not only make you a master Google-er, but you get a basis on what your story should be like? Check. Night classes that help you build your skill and allows you get to know your soon to be Karaoke buddies? Double check! But then the math test of radio tasks comes, and you’re stuck there hoping that if you get enough right, you can walk out of there with a C-minus. What I’m referring to is the task of newscast assistant (buh buh bummm). It sounds easy enough in theory: you pick two to three news stories; you write them out in a conversational tone; the newscaster comes to read it; boom, bing, bang, you’re done. Unfortunately, though, I didn’t know that, so I created what I can only describe as a bad screenplay written in a Peet’s Coffee. I mean from the names written on the side to the fake responses for the other characters. It was bad, and it was due before four o’clock. Of course my caster that day was news director Ben Trefny, who low key reminds me of those anime character that are like super chill and goofy but have this almost scary super ability that makes people question their personality (in a good way). He shows up 15 minutes before its due, deletes it all and churns out a whole two pages in five minutes with ten minutes to practice and even has enough time to teach me not only how to do it, but how to perform it live. Ben super-saiyan-ed me. I couldn’t even walk out of that situation defeated, because it was handled so beautifully that my brain had to catch up. I then knew that this was not a final, but merely a practice test, and it was okay not to pass the first time around. And so I leave you with my experiences so far. I have been a nervous wreck for a bit of my life; a perfectionist to an unrealistic degree, and a person not as confident in their radio abilities as one with experience should feel. But I’m here. I know that what I’ve learned and experienced so far will only take me to higher places. I am among amazing people not only with KALW staffers, but with my fellow Academy members who are actors, and comic book enthusiasts, and Google workers. (Don’t You Forget About Me by Simple Minds fades up from the background.) We’re here to learn, and we are learning, so I guess you can equate it to a John Hughes movie. So if you’ll excuse me, I have deadlines to make and a fist to throw in the air. Don’t you, forget about me.